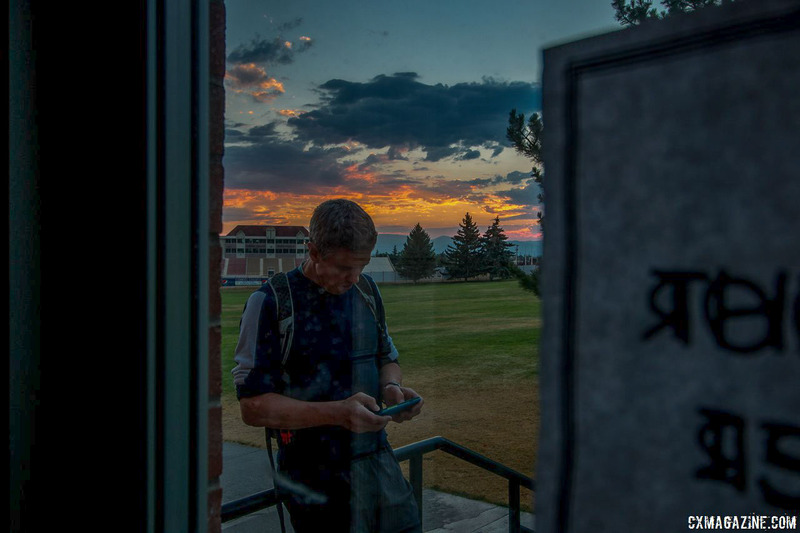 HELENA, Montana—It’s 6:10 a.m. and Geoff Proctor has been standing outside the dorms in the dark for 10 minutes by himself, catching up on email on his phone. “Ten minutes early is on time,” he tells the attendees early on in the camp. 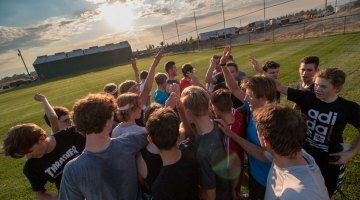 Proctor, an AP English teacher at Helena High in Montana, teaches by example, showing up to his own workouts ten minutes early even by Proctor time. The running starts at 6:20 a.m., but the sun conveniently peeks over Nelson Stadium at 6:10 a.m. Proctor knows who has heeded his advice by watching who exits the dorm in the dark. The sun will highlight those who are late. Most of the attendees take the message to heart. 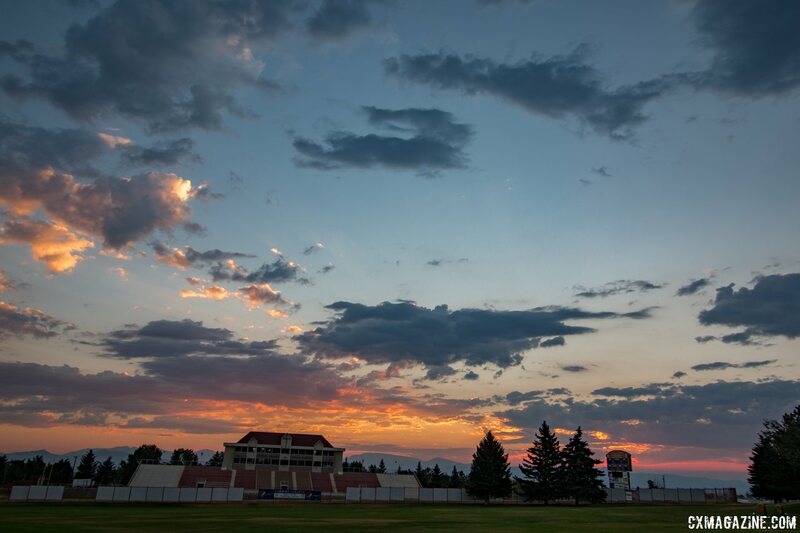 Half asleep and groggy, one by one they trickle out of the dorm, just as the sun’s first rays trickle over Carroll College’s Nelson Stadium. The campers sit by the door, quiet and nearly motionless, as if they’re reptiles looking to warm up with the sun and conserve energy for the strenuous day ahead. Long gone are the animated conversations about tire preferences and Snapchat streaks that filled the halls the night before. By 6:20 the group is standing up, gathered around Proctor, ready for their cross country run through campus—a group warm-up jog that would be more than enough running for most of us non-running types—but the running is just getting started. This is just the warm-up to the first of three workouts on the schedule for the day. 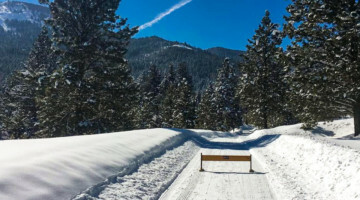 While most of us would kill for the opportunity to kick start our cyclocross season with a week-long training camp like Montana Cross Camp, the sheer volume and intensity of the camp might exact revenge and kill many of us in return. Proctor’s training camp, now in its seventh year—and its second without funding by USA Cycling—is tailored to our nation’s top Junior and U23 talent. 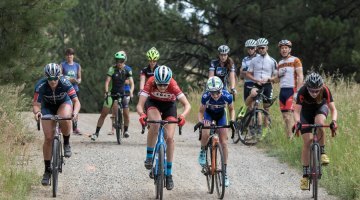 I attended the camp as an embedded journalist, and recognized more than a handful of current and former Cyclocross National Champions among the 13 to 21-year-old attendees. 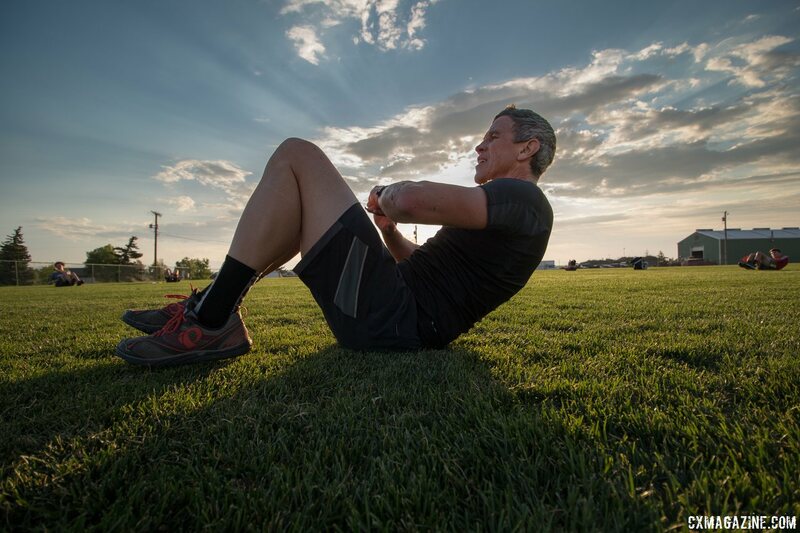 Unlike me, these athletes are ready for the training load. 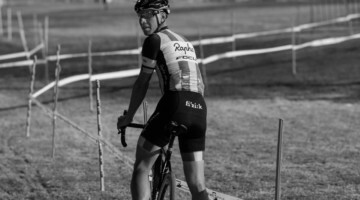 While most of us won’t make the cut as applicants due to age and talent, there are still many takeaways from the camp relevant to the average or even newbie cyclocross racer. Sure, having peers do the workouts with you during a beautiful Montana sunrise, with four coaches watching and helping ensure you have the right form, might be a more desirable experience, but not everyone is so fortunate. 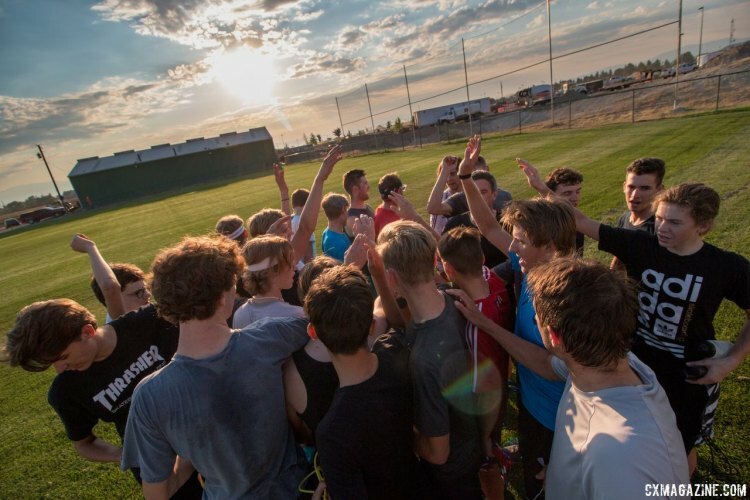 Today, we take you inside Montana Cross Camp for a look at the comprehensive approach to cyclocross conditioning Geoff Proctor has developed based on his years of ski and soccer team experience. 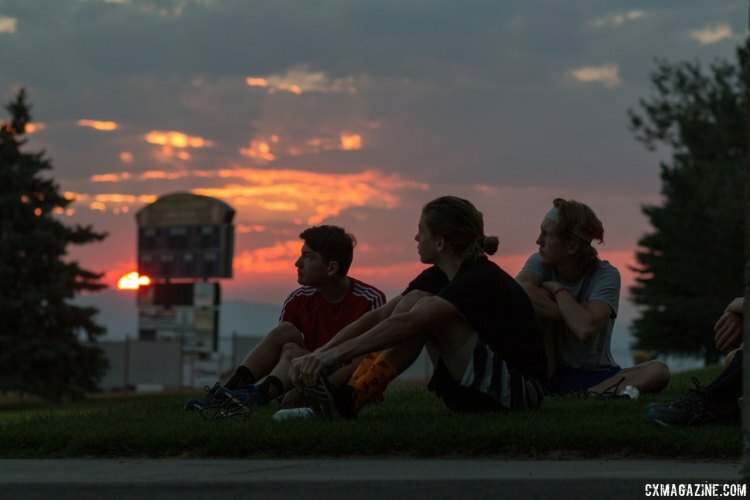 Today’s piece will highlight a typical Montana Cross Camp morning training session with photos and videos, and in the coming days, we’ll also look at some of the on-bike drills campers experienced and meet the campers. Come along for the ride, which is this case, is a run. Through his workouts, Euro video clips and Sven Nys anecdotes, Proctor is unapologetically preparing his campers to be ready for cyclocross races in Europe, perhaps at one of three USA Cycling Development blocks, including the Christmas week that was formerly known as EuroCrossCamp. Part of that preparation is an emphasis on running—something many campers freely admit they do little of in most of the season’s domestic races—but of more importance in Europe’s muddy or sandy races. Campers start each day with a cross country run through the Carroll College campus, and it’s one of the few times when there’s no competition. The group stays together for the ten-minute jog, but it’s just the start of the morning’s suffering. They end at the stadium where they’ll do more sprints and stairs before finishing the morning’s workout doing sprint repeats up hills. 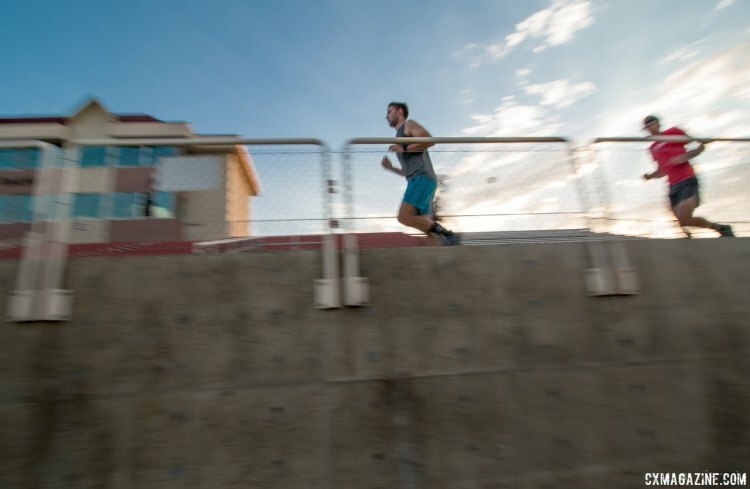 For some, the running is a shock to the system—something they haven’t done since cyclocross season—perhaps because a busy road or mountain bike season has taken over their lives. 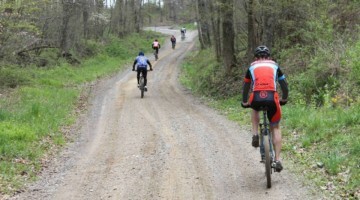 For others, especially returning campers, it’s a chance to show off their year-round cyclocross training. 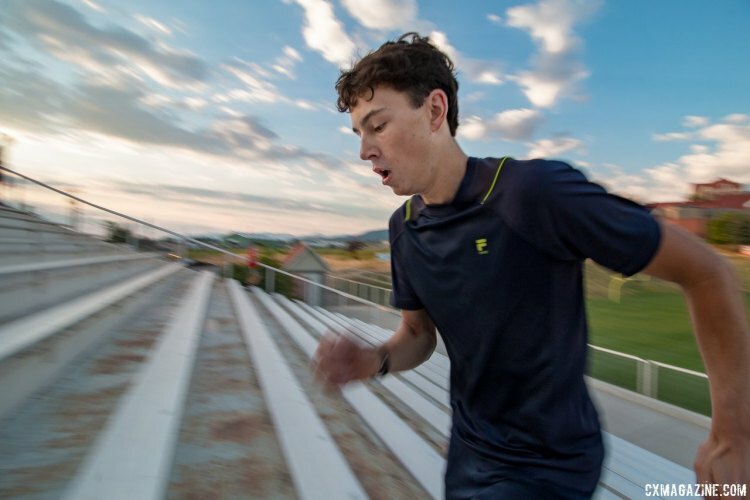 John Paul Amalong, one of the youngest attendees of the camp, certainly returns home to Chapel Hill, North Carolina with more motivation to run. “I’m going to find a big hill to sprint up,” he said. It’ll be a new aspect of his training. “I did very little [running], and I hadn’t run before this camp this year either. In fact, our most local course, there is no running except for the barriers, ” he explained. 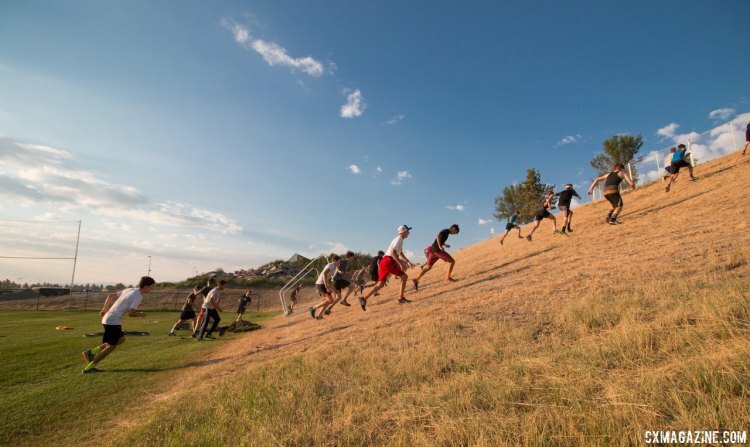 Whether you find yourself in this camp, or hope to recreate a bit of the suffering, last week’s Training Tuesday piece by Chris Mayhew on running may be a good place to start before you start tackling monster hill repeats. 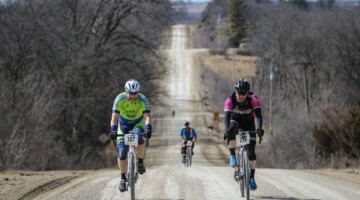 Proctor preaches that a cyclocross athlete needs to be good at more than just pedaling and prepares his campers to be ready for remounts, dismounts, running and crashing through a series of exercises that he’s harvested from his early years as a ski racer and his two sons’ many years playing soccer. The first drills, after the warm-up run, focus a lot on leg strength and range of motion, and feature lunges, leg swings, sprints and hip flexor movements (“open the gate” and “close the gate”). Consistent with modern research, the focus is on dynamic movements with little static stretching. These workouts and drills are done in the shadow of the stadium’s bleachers, which await them next. Helena sits at a lofty 4,058 feet, but that’s not high enough for Proctor. 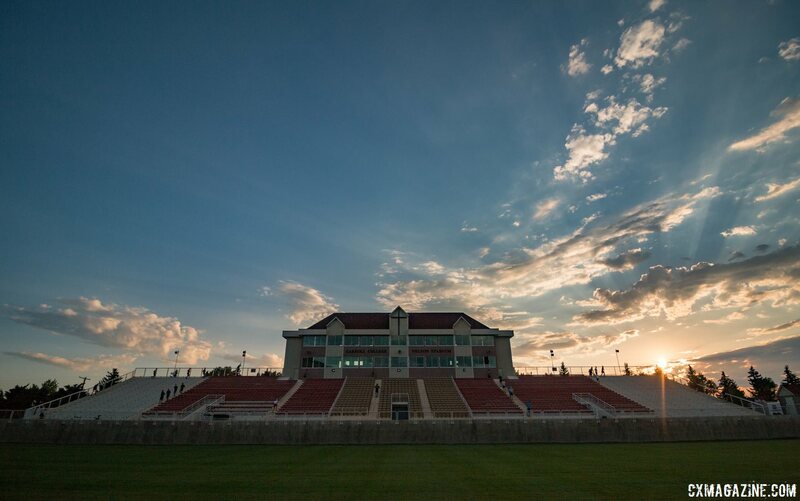 Each morning, after the run and on-foot drills, Proctor has the campers reaching for new heights with repeats of sprints up the stadium stairs. Up one aisle’s staircase, traverse, down another, traverse and do it all over again. There are four climbs per set, and during the week, campers build up to six sets. On the final day, campers have heavy legs, but thankfully it’s a taper day, with “only” three sets. The campers are instructed to sprint up with small strides (no double steps) and jog the traverses and stairs down. Just like in racing, campers quickly form small groups, using each other for pacing. Gaps open up. More Movement, More Core and Crossfit? 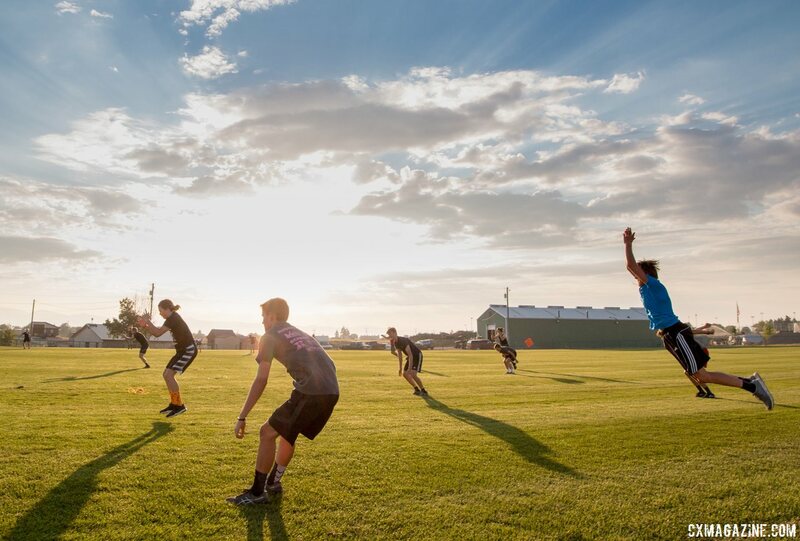 After the stadiums, the group heads to the grass for more strength and conditioning drills, many of which are also borrowed from soccer and ski training. Proctor could stand around, watch and critique, but he still is every bit the participant. In a large circle, the group does leg lifts, lunges, crunches, jump rope, jumps, burpees and lots of hip flexor exercises. On a different morning, the group worked on foot speed with speed ladders. The drills add whole-body exercises that soccer players and Crossfit athletes are familiar with, but are uncommon in a lot of cyclists’ training. Proctor, always the teacher, has the campers do the drills while counting in foreign languages. 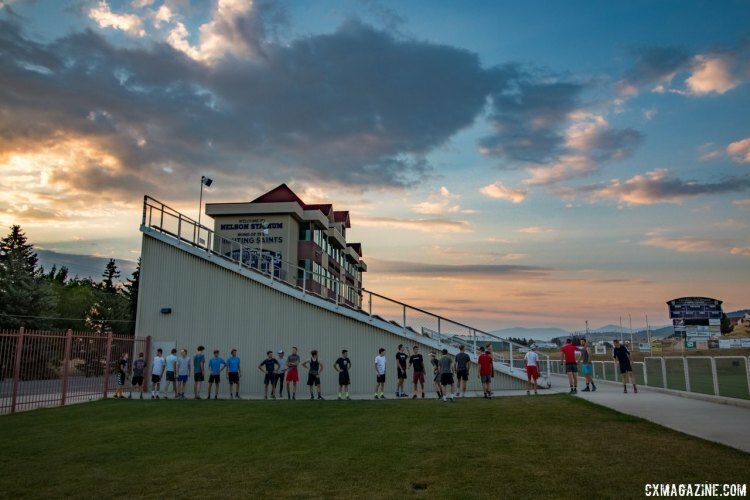 For returning camp members and former soccer players, the exercises are a familiar pain, while others take giant strides throughout the week in mastering the exercises and beating back sore muscles. After the jumps and drills, the group heads to the hill for another set of hill sprints. I was exhausted just chasing them around for photos and videos without even participating. On Friday, the final full day of camp, after four hard days of workouts, the mood seems celebratory. It’s their final morning workout, and there are just two more sessions in the day before the long-awaited ice cream ride. Many of the drills and exercises from the camp could easily be integrated into your day, before or after a ride, into a ’cross practice, or even into your walk across the parking lot from the car to the office or grocery store. For a more authentic experience, you can head out the door a few minutes before sunrise before breakfast and start your drills. No, I’m not leaving you with the specific plan used at camp, or even an adjusted one for us mere mortals, but just a glimpse into the pre-breakfast routine at Montana Cross Camp. 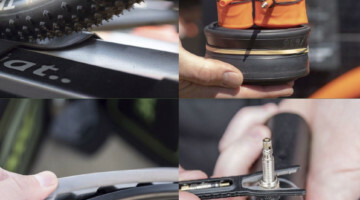 A quick search on Youtube will lead to plenty of instructions on how to do many of these exercises, getting you one step closer to training like a top cyclocrosser. Better yet, if you’re inspired but not sure how to do such exercises, find a local coach or trainer and share this piece with them. Ask them to help you embrace a proper dosage of Montana suffering. See Part 2 of our inside look at Montana Cross Camp here, and watch and read our ever-growing collection of camp attendee interviews here. 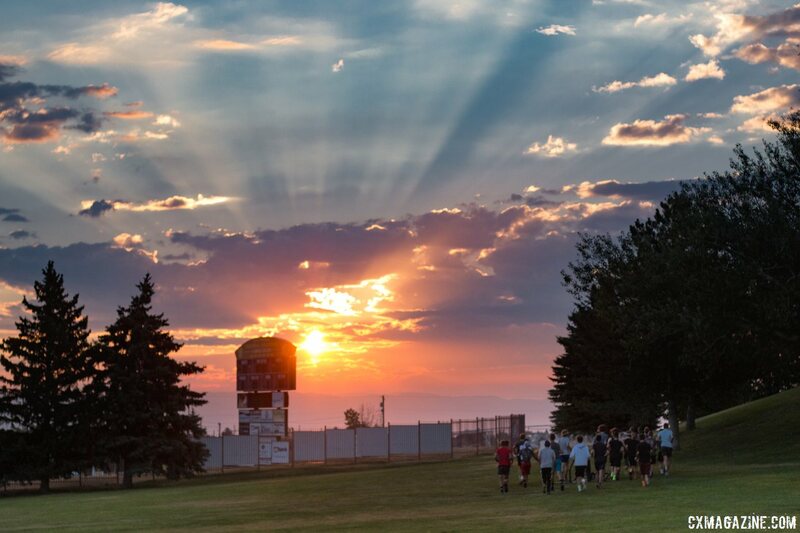 See a gallery of images from the Montana Cross Camp morning workout below. See an image you like? Support our coverage of cyclocross by grabbing an image here. We’ll keep adding to the gallery throughout the week.